Good ergonomic positioning makes operation easy, reduces body stress, accidents and injuries. The deployed ladder is inclined to the ground and at a height in the rear that is easy to remove and carry away. 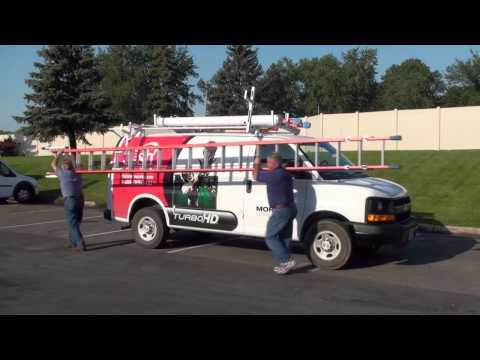 The asymmetric movement of the ladder rack reduces the pull force applied to the handle to move the ladder by 50%. This means you’ll be able to move a 120 lb. ladder with the same physical exertion as moving a 60 lb. ladder with a Horizontal Rotation. The hydraulic cylinder provides smooth, controlled ladder deployment and stowage. Cylinder is adjustable to accommodate ladders of different sizes, weight, and seasonal temperature changes. 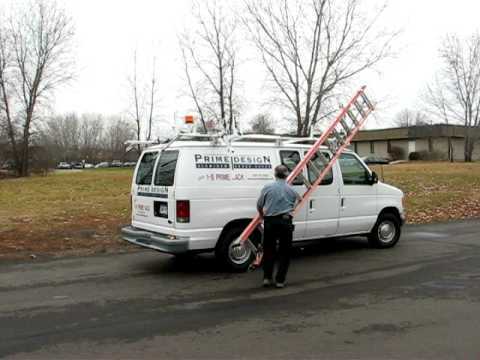 Standard feature automatically secures ladders without additional straps or climbing on the vehicle. Safe for the operator, and safe for driving. Durable, fully padded rubber contact surfaces protect ladders for long service life. Durable powder coated aluminum keeps your vehicle looking professional.